Hi Julie, Bronxelf. Hurray for WGD. Happy World Goth day, littlebats. 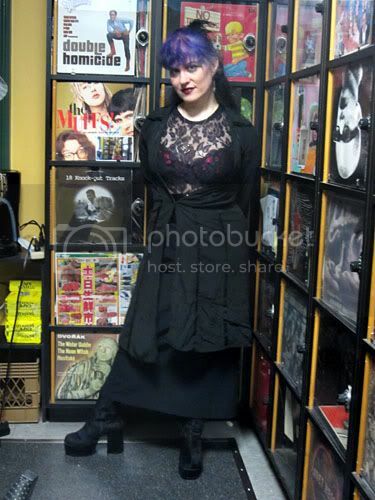 evening julie and everyone... is "happy" world goth day quite right? should it be "mournful" world goth day or something similar? I am totally carrying a proper gothbrella. ''Ladies'' he said, bowing and tipping his stove pipe black hat but not so much as to dishevel his velvet cape. Thanks for the Pirata Band from your Ukrainian listener! cheers to ukrainian listener from a moscow listener! I`m also very pleased every time they promote east slavic stuff! you don`t hear that on russian radio. Hallo! Apparently Im talking about kitkats and potato chips. And my frankenboots. World Goth Day is finally upon us! Good transition too from Cocteau to Speaking Silence, and All About Eve. "In the Gold Dust Rush", "It's All But An Ark Lark", love those early titles! LOL, "You All Need Help - I actually got to use that on the air!" Hey I say that *at least* 3 times a day. And now Sisters of Mercy! I've got all my lights off, wearing black and my black fedora hat while listening. It may be early but I'm bringing WGD in as best I can! It's been a great dancey set! Oh. I appear to have found the commenty thing. I should have been on this ages ago. Hi. Goth Luau! Goth Beach Party! That's something that should be worked out, helps Goths in summer and Hawaii do their thing. Ahoy, Cruel Britannia! Enjoyed your WGD promo. 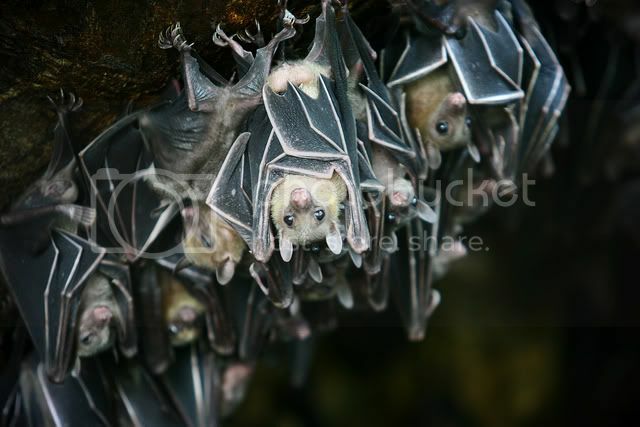 awwww LOVE the adorable lil BATS!!! good morning (mourning?? ha ha could not resist the lame pun!) Ms. Julie and Ms. DJ Bronxelf! and WOW!!! i did not even know that there is a WORLD GOTH DAY!!!!!!! thank you for enlightening me!!! hey, i'm just a fan, tuned-in for good music & DJ patter, you guys. thanks for saying so, Matt! And totally, all the band names that come from song titles and album titles. It helps if you know the year of release of both, then you could have some estimation of which order is which. Hi Razi. Happy World Goth Day! Stil loving the Cocteaus cover, btw. What's next in the pipeline, Sir? @razi: Hey, it beats a tin can anyday! good morning. Glad to wake up to this. And thought this Can The Can sounded familiar. If I Knew Suzy...I wouldn't have to look that up! Ghost Dance also did that "Heart Full of Soul" cover I like--don't suppose they're still around? @bronxelf I need something or other. But mostly, a cigarette. And a reason to follow up plans for World Superhero Golf Day. @DJCB- i am NOT YET AT LIBERTY to specify which tune is in-progress, because: reasons. I will say the artist was played on this show already this evening, and sound clips might be this week. just a few more details to see if it is working. @bronxelf the only suit I need in life is my black & white pintsripe 'Boardroom Killer'. I think glowy bits might spoil the image. I dont know if I want to know about your glowy bits, CB! hi @Julie- pleased to make your acquaintance. And your playlist! @Razi fair enough. I'm still tempted to peek under the tarpaulin every nowe & then to see what you're buildin'. I look forward to it. Ey up, Grum! It's like Twitter in here now, but accessible over works internet! Yep, and on WFMU,too- home of my beloved Lux & Ivy's Favourites shows.. How cool is that? ! "New Wave Goes To Hell"--if Stun Gun is any indication I think I will like that album. What? I have no id-oh, ...wait. Point taken. I'm going for a smoke. How is everyone celebrating WGD? Im gonna be at GOTHIKA all day but you knew that. oh wow LOVE this version of "Ghost in You" . . . tears and fond memories . . . ! what and where is GOTHIKA! I'm going to drink Jäger out of a shot glass with a skull on it! And I've got clove cigarettes fresh from Oz, will smoke after dinner and enjoy my "Bret Ellis dessert", a clove cigarette and kir royal! I will be able to wear all black to work, and may check out gothy music videos later. KIR ROYAL! ABSINTHE!!! ARAK!!!! AGUARDIENTE!!!! perhaps dig out some old Lou Reed -- after all, it was seeing a photograph of him -- maybe 1972? -- wearing the BLACK nail polish that inspired me so . . .
Gothika is always so hard to explain. but it's a virtual club- you can hear everything live on the net if you like. You missed us talking about the stupid thing in my hair earlier. Paradise is the only one I have, the only one I need. Regular listeners of my sets can vouch for my unholy love for Gary Numan. "Ours is a love that is unholy, undying...and absolutely nothing to do with 'Cars'..."
I think this is our last one folks, we'll have to run on out after it. Thanks so much for listening! Appropriate Nick Cave to end on. Thanks Julie and Bronxelf, another fine program together! Have a great World Goth Day Tuesday everyone! Celebrate it! And....a fitting tribute to both Donna Summer and Robin Gibb right off the bat to start the show...nice! Enjoyed the interview with DJ Cruel Brittania! "Micky Most asked songwriters Nicky Chinn and Mike Chapman for a song for Suzi Quatro and they came up with this. When asked what "Can The Can" means, Chinn replied: "It means something that is pretty impossible, you can't get one can inside another if they are the same size, so we're saying you can't put your man in the can if he is out there and not willing to commit. The phrase sounded good and we didn't mind if the public didn't get the meaning of it."" Good work, thanks Van! I was wondering what was behind "Can The Can". early tuesday shows make good soundtracks for thursday evenings too! thanks!